I often think about an August afternoon when I was 17, sitting in the back of a friend’s parked car. “Come Together” comes on the classic rock station—I haven’t heard it in many years. Anyway, I discover I’ve never really heard it before, or at least never thought of it as much more than an oldie from before my time. At that moment, as the hazy, late summer sun beams through the car’s windows, I’m utterly transfixed by this beguilingly swampy music: the percussive shuffle played in conjunction with its six-note bass riff, John Lennon’s nonsensical lyrics about “toejam football” and “walrus gumbo”, the song’s overall push and pull between mystery and lack of guile. It immediately feels richer and far more complex than any contemporary music I was into at the time. Three months later, while browsing through the CD racks at one of many neighborhood libraries I began frequenting after obtaining my driver’s license earlier that year, I spot a copy of ABBEY ROAD. Perusing the track listing on the back, I see “Come Together” on it, along with “Here Comes The Sun”, a Beatles song I heard far more often in my youth. Not familiar with any of the other tracks (“Maxwell’s Silver Hammer”?, “Mean Mr. Mustard”? ), I nonetheless check it out and listen to it in my bedroom at home, looking forward to hearing “Come Together” again, not really expecting much else from the album. I could try relating what it must have been like to encounter ABBEY ROAD for the first time, but that was over twenty years ago and I don’t even remember if I loved it or entirely understood it on that first go around. But it must have left some sort of impression, because I returned to it again and again until I knew it by heart. Gradually, it influenced my musical taste with intensity unmatched by anything else I had previously heard. Without ABBEY ROAD, I would not have devoured the entire Beatles catalogue over the course of my senior year of high school; nor would I have begun listening to classic rock radio, in turn discovering (and, via many artists, rediscovering) a compact but rich history of popular music I had previously ignored, simply because it was from the past. For all of its personal significance, and general accomplishments and innovation, what seems most astonishing about ABBEY ROAD now is that it even exists. In the three years since REVOLVER, the Beatles cemented their status as the decade’s most iconic musicians (SGT. PEPPER’S LONELY HEARTS CLUB BAND), and then slowly began to unravel (THE BEATLES, aka The “White” Album” often comes across more as the work of four separate artists than a real band). Following aborted sessions in early 1969 that eventually became the basis for the album and documentary film LET IT BE, one had no reason to expect anything close to a masterpiece from them. Fortunately, we have the persistent Paul McCartney to thank. The legend is that he approached the band’s longtime producer George Martin (who was not part of the LET IT BE sessions), suggesting that the group make an album “the way we use to do it”, i.e. with Martin in control. Certainly, ABBEY ROAD is the band’s most lush and elaborate production since SGT. PEPPER’S and it arguably even exceeds that studio marvel in concept and sophistication. However, as much as McCartney and Martin tried to recreate past methods, The Beatles simply weren’t the same band they were on REVOLVER, or more accurately, its four members weren’t the same men who conquered the world five years before. When they broke up months after ABBEY ROAD was released, you sensed it was because they had outgrown each other (Robert Christgau was more blunt on the subject: “they couldn’t stand each other anymore.”). Thus, the album’s first half plays like a more focused side off The White Album, almost resembling a nesting doll in that it begins and ends with a John Lennon song, sticks two Paul songs in the middle, and places one song each by George Harrison and Ringo Starr on either side between the John and Paul songs. John’s “Come Together” is the first track, as powerful and iconic as any of the band’s album openers. It also preceded the album as its single, albeit as part of a double A-side with the song that follows it on the album, George’s “Something”. In the US, where double singles charted in separate positions in Billboard at the time, “Come Together” reached number one, while “Something” peaked at number three. In the UK, where double singles charted as one entity, “Something” was listed ahead of “Come Together”, the first (and last time) a George song achieved this status. Indeed, “Something” is one of his greatest compositions, a swaying ballad whose melody and yearning guitar effortlessly float over one of Paul’s most expressive basslines. Soft and sensual without feeling sappy or sugary, “Something” has become more of a standard than “Come Together”, covered by everyone from Frank Sinatra to Joe Cocker (of course, I had heard it before, but without any idea of who sung it or what it was called). Paul’s two subsequent songs seem as dissimilar as two tracks could be, until they don’t. Initially, “Maxwell’s Silver Hammer” feels like the most stubbornly silly, flimsiest thing he ever wrote as a Beatle, while “Oh! Darling” is in contention for his hardest rocking, most over the top vocal performance outside of “Helter Skelter”. But then, over time, you notice the former’s perverse, unnerving subject matter, its cheery, upbeat surface repeatedly undermined by disquieting synthesizer flourishes (the instrument then-new and entirely foreign-sounding). On the latter song, Paul is at once so soulfully passionate and at an emotional extreme that verges on self-parody that you don’t know whether he’s being heartfelt, satirical, or both. “Octopus’s Garden”, the token Ringo songs that follows, is often dismissed as an inferior sequel to “Yellow Submarine”; perhaps I’m just sick of the latter’s ubiquity, but I actually prefer the former to it—I always thought it was an ideal showcase for Ringo’s slightly flat, homely charm, exuding sincerity and wonder that could not have come from John (too cynical) or Paul (too whimsical) at that point. George’s guitar work also lends the song an irresistible brightness—a direct contrast to John’s gloomy sinister epic, “I Want You (She’s So Heavy)” which closes side one. The song literally vacillates between two sections delineated by the title: “I Want You”, a near-lithe, mid-tempo rock number that’s a palette cleanser after Paul and Ringo’s lighter pursuits, and “She’s So Heavy”, a slower, droning dirge in ¾ time with no lyrics apart from the title. It concludes with this latter section as an extended instrumental coda, repeated at least a dozen times, a white noise machine slowly becoming more prominent (yes, with this and “Helter Skelter” the Beatles kind of invented heavy metal), until, seconds away from the eight-minute mark, everything abruptly stops. If side two of ABBEY ROAD was exactly like the first, I wouldn’t be writing about it here. Not to diminish those six songs in any way, but they simply make up a solid album side. Comparatively, the album’s second half, in my opinion is the most impressive sequence of songs the band ever devised and sequence is the key word here. As we’ve seen on all of the preceding five albums I’ve written about in this project, a big part of their appeal is in how they’re structured—not just the consistency and quality of the songs, but how one song fits next to another and how they often resonate both individually and collectively when heard in a particular order. Attention paid to sequencing is obviously a fundamental part of what makes an album great. On ABBEY ROAD’S second side, compositions that alternately feel complete and half-finished are strung together to form a medley of sorts. As the last side of the Beatle’s last recorded album, it now registers as a farewell, a summation of all of their individual strengths that also collectively pushes them to a place perhaps not as sonically reaching as “ A Day In The Life”, but certainly one exceeding it in emotion and spirit. It begins with George’s “Here Comes The Sun”, as excellent a song and as much of a standard as “Something”. Hearing it immediately follow “I Want You (She’s So Heavy)” on the CD, the contrast between the two tracks could not be more pronounced: whereas John’s feels like an inexorable trudge towards death, George’s evokes a sense of rebirth. He sings, “I feel that ice is slowly melting” over an ebullient, up-tempo backdrop where the synths emit as much warmth as the acoustic guitars. If it’s an ideal side-opener, then John’s “Because” makes for a perfect, minor key segue. Over a melody that’s purportedly inspired by Beethoven’s “Moonlight Sonata” played backwards, the tripled-tracked, three-part harmonies by John, Paul and George are among the most complex and gorgeous vocals the band ever recorded. The mournful, opening piano chords of Paul’s “You Never Give Me Your Money” follow and side two’s ambition begins to reveal itself. Much like “Band On The Run”, that later solo hit of Paul’s, this song has three distinct sections: the first resembles a chorus, featuring the song’s title sung over those piano chords, the second increases the tempo and comes off more like a verse, and the third elevates the momentum to the point of rocking out, concluding with a guitar riff entirely different from the opening melody. Examined closely, you can spot the vestiges of three separate unfinished songs, but when you hear it as a whole, it doesn’t matter because everything seems to fit together: a testament to Paul’s songwriting prowess, George Martin’s expertise as an arranger, or simply luck? The next few songs suggest a combination of all three possibilities. As that final riff of “You Never Give Me Your Money” repeats and fades into the ether, a beautifully slow, quiet, meditative instrumental emerges. Carried along by a twangy guitar riff, “Sun King” allows listeners to catch their breath after the previous song’s multiple changes. Following a sudden, wordless, heavenly wash of harmonies at 0:52, the lyrics finally appear: “Here comes the sun king,” an obvious callback to side two’s first song. After the lyrics blissfully dissolve into gibberish and the guitar riff plays a final time, the drums pick up and “Mean Mr. Mustard” begins. One of John’s playfully grotesque character sketches, its second verse introduces the title character’s sister Pam. Not long after that, a booming, Pete Townshend-like power chord provides an intro into the next song, “Polythene Pam”, which amps up the tempo (and John’s clever wordplay) even further. It also has another callback—not to another song on ABBEY ROAD, but to an earlier one in the band’s career with its knowing “yeah, yeah, yeah” chorus. An instrumental coda then barrels towards a sonic crash (preceded by Paul warning us, “oh, look out!”), seamlessly leading into “She Came In Through The Bathroom”, a shuffling, mid-tempo rocker featuring one of Paul’s most agile and indelible melodies. At this point, you can’t help but step back and marvel at all the ground ABBEY ROAD has covered over the past five songs. Then, a moment of silence appears–remarkably dramatic because it’s the first one in ten minutes and 45 seconds, since the end of “Because”. “Golden Slumbers” breaks that silence with plaintive piano and one of Paul’s loveliest melodies and vocal performances—more passionate than that of “Oh! Darling”, certainly more profound than that of “Maxwell’s Silver Hammer” and emotionally nearly overwhelming as the orchestration adds majesty and purpose. Just before you expect the chorus to return after the second verse, it seamlessly segues into the next song’s chorus, “Carry That Weight”. And then, in perhaps the album’s most resonant callback, the opening melody from “You Never Give Me Your Money” returns as an orchestral fanfare. Paul incorporates another verse of that song into this one, only the lyrics have changed (“You never give me your pillow…”). Then, the “Carry That Weight” chorus returns, before the song concludes with the melodic riff from the ending of “You Never Give Me Your Money” as another orchestral fanfare. I’m certain the first time I recognized this connection, my head was spinning—it’s also likely the moment when I truly fell in love with the album. The only way the Beatles could possibly top or extend all of this would be to go out with a bang. After that second callback to “You Never Give Me Your Money”, the tempo shifts again, and “The End” kicks off with Paul singing, “Oh yeah! All right! Are you gonna be in my dreams tonight?,” before giving way to a simple but effective drum solo—significant in itself because Ringo rarely did drum solos. With a few final propulsive beats, it leads into an extended vamp recalling the joyous, primal rock and roll of the band’s first few albums. John, Paul and George all participate in a three-way guitar solo, taking turns every two measures, each of their styles immediately recognizable and distinct. Then, the drums cease, a lone piano appears, and over a few guitar filigrees and a return of the orchestra, Paul sings the simplest yet most profound lyric he ever wrote: “And, in the end / the love you take / is equal to the love / you make.” One couldn’t ask for a better finale to a song, an album or a career—particularly from the most popular band of its time. 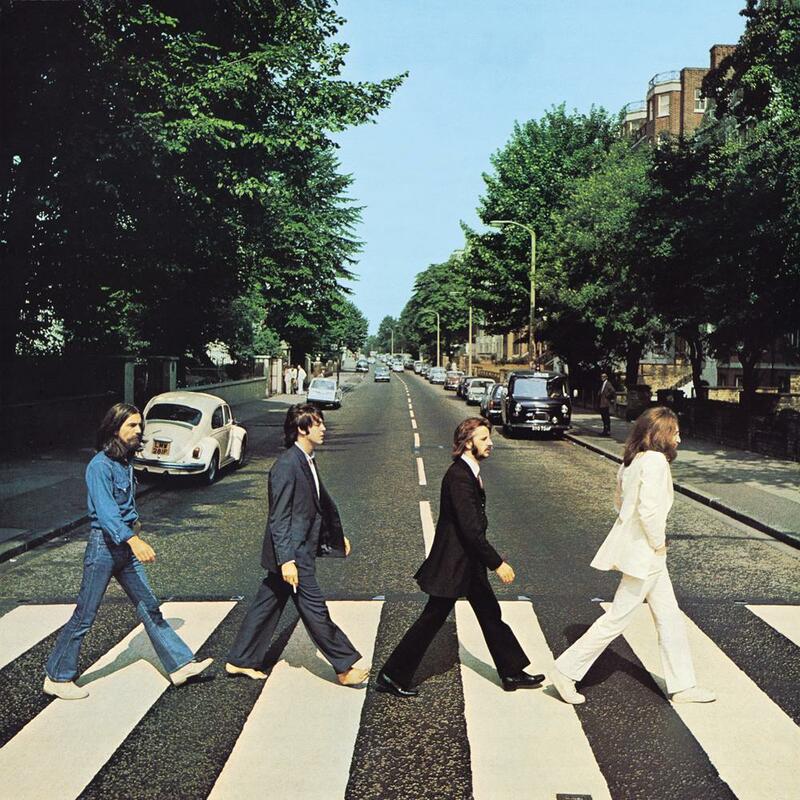 The Beatles being The Beatles (or perhaps Paul just being silly), ABBEY ROAD actually doesn’t end with “The End”. Eighteen seconds after that final, resounding orchestral flourish, another song literally crashes in. “Her Majesty” lasts less than a half-minute and sounds like something Paul came up with on the spot. After that first chord (actually the real ending to “Mean Mr. Mustard”), over a lone acoustic guitar, Paul sings the type of ephemeral little ditty you’d expect from a street busker or music hall comedian. The album equivalent of a brief bonus scene appearing after the long credits roll of a feature film, it doesn’t diminish its grandeur, but it does bring The Beatles down to earth a little. Although nearly a half-century later we continue to perceive them as pop music gods, the band’s brilliance and lasting imprint on pop culture was due as much to our ability to relate to them as it was to their vast musical innovation. From “Love Me Do” to “Her Majesty”, they rewrote the script as to how pop stars could behave and create. The most tragic thing about their breakup is that none of them individually could accomplish anything on the scale of what they were capable of collectively. No John, Paul, George or Ringo solo albums will appear in this project, because none are half as great as ABBEY ROAD (or REVOLVER… or SGT. PEPPER’S… or A HARD DAY’S NIGHT etc;). Perhaps tragic is too strong a word—every time I hear ABBEY ROAD, I still wonder how anyone could possibly top it, or why anyone would want to. Next: two men—one singer, one songwriter.